Habit: Perennial herb, low-cespitose, cushion-like; caudex woody, many-branched; hairs simple or mixed with stalked forked or +- many-branched hairs. Stem: scapose, erect, leaves 0--few. Leaf: basal rosetted at tip of caudex branches, sessile, entire, thickened at base; cauline few or 0, bases not lobed. Inflorescence: +- elongated; bracts 0--few. Flower: sepals erect or ascending, base not sac-like; petals white to pale yellow. Fruit: silicle, sessile, ovoid to ellipsoid, dehiscent, unsegmented; valves rounded or keeled, glabrous or hairy; stigma entire. Seed: 1--4, plump, +- ovoid to oblong; wing 0. Habit: Branched hairs curled, simple hairs stiff. Stem: 2--6 cm, simple. Leaf: linear to oblong, not leathery, margin ciliate; cauline 1--5 as bracts. Flower: sepals 2.5--4 mm; petals 3--4.5 mm. 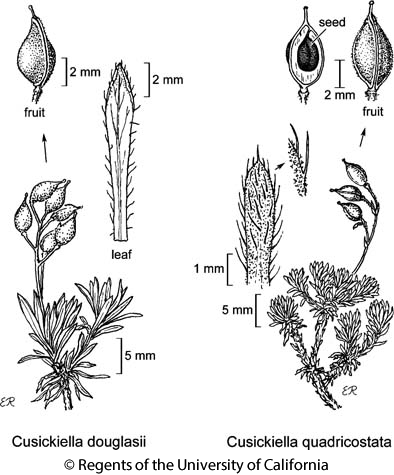 Fruit: 3--5 mm, ovoid, 4-sided; style 0.5--1 mm; pedicel spreading to ascending, 2--5 mm. Seed: 1.8--2.5 mm, ovoid to oblong. Citation for this treatment: Ihsan A. Al-Shehbaz 2012, Cusickiella quadricostata, in Jepson Flora Project (eds.) Jepson eFlora, http://ucjeps.berkeley.edu/eflora/eflora_display.php?tid=21478, accessed on April 22, 2019. SNE (Mono Co.); Markers link to CCH specimen records. Yellow markers indicate records that may provide evidence for eFlora range revision or may have georeferencing or identification issues. Purple markers indicate specimens collected from a garden, greenhouse, or other non-wild location.